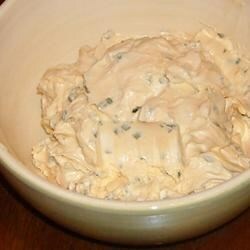 "This creamy, cheesy dip is truly a crowd pleaser, and it's so easy to make! Cut onion bagels into bite sized pieces for dipping." In a medium bowl, mix the cream cheese and sharp processed cheese food until well blended. i thought it tasted cheap, kinda like cheeze weez. I had this at a party and thought it was great! It was the first thing gone. I was happy to find out how easy it was to make! This is great!! I use regular cream cheese and add garlic powder to it. I usually have to double or triple this recipe because it goes so quick.